I know it’s weird, but I prefer ebooks to paper books. They’re portable, I can set the font size, and every book is in the same form factor. So I was thrilled to learn my local library offers ebooks—and there’s a good chance yours does too. The best way to find out whether your library offers ebooks or audiobooks is to check the website of your local library or ask a librarian. You can also check online, depending on which service your local library users to offer ebooks and audiobooks. Rakuten Overdrive is a popular choice; you can check if your library uses Overdrive here. Another such service is hoopla, and you can check this map to see if a library near you offers the service. Those are just two services, though: there are others, and we can’t cover them all. Ask your local librarian about ebooks; they’ll be happy to help. You’ll need a library card to sign up for such services, but once you’ve done that you can borrow books from home—no visits to the library required. Libraries have offered movies for a long time, but some libraries go beyond checking out DVDs and provide free access to streaming video. Kanopy is a streaming site offered by libraries around the United States, providing access to documentaries and Criterion Collection films. It’s no Netflix replacement, but it’s a great supplement. Check if your library offers Kanopy access, or ask a librarian. 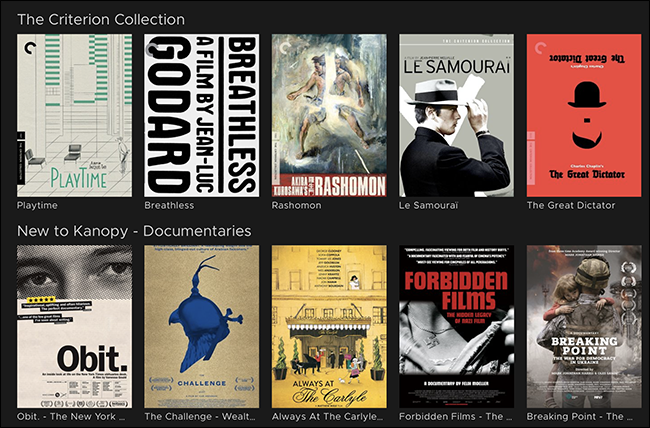 Kanopy isn’t the only streaming service your library might offer. Hoopla, which we mentioned above, offers movies and TV shows in addition to ebooks. And there are even more streaming services out there. Again, check the website for your local library or ask a librarian for more information. Good journalism is worth paying for, but not everyone can afford it. Your local library might offer a middle ground, paying for subscriptions so that everyone has access. My local library, for example, offers free access to the New York Times website. When I’m visiting the library, the paywall doesn’t apply, and I can request a three-day subscription whenever I want for use away from the library. Several major library systems offer this, including Los Angeles, but we could not find a definitive list. Check the website for your local library or ask a librarian about whether it offers any newspaper subscriptions. And it’s not just newspapers. Some libraries, particularly university ones, offer access to online research resources like Lexus Nexus. This is well worth looking into, and many people never think of it. Several sites on the web offer access to online courses, but the better ones require a subscription. Your local library might already be paying that fee, however, meaning you can access these lessons for free. For example, your library might offer free online courses from Lynda.com. There’s no list of libraries that provide this feature, so check the website of your local library or ask a librarian for more information. This isn’t an online service, but it’s something that’s easy to overlook. Your local library probably offers DVDs, Blu-Rays, and CDs in addition to books. The latest and greatest films are generally already checked out, but browsing the rest of a collection can feel comfortingly like Blockbusters and CD stores of old—except everything is free to borrow. There are generally even audiobook collections if you don’t mind dealing with CDs. I highly recommend checking out the AV section of your local library if you haven’t for a while because you might be surprised how extensive it is. Even better: if you can’t find something, you might be able to request it from a nearby library.